Baby Mama: Again, we are wasting our money. Again, we are wasting our money. 1. 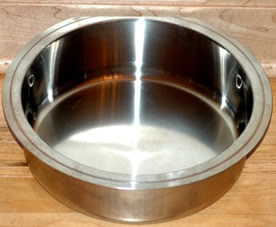 Diddy's water dish. I guess it is very fun to see how wet we can get our pants by splashing in Diddy's water bowl before 8:00 am. 2. Diddy's chew toy. Diddy only has one toy that has survived his puppy days. It is a yellow dumbbell that his Auntie Mary gave him. It is old. It is dirty. Real dirty. It makes me cringe to think what kind of germs and nasty business are on that toy. And Paul loves it. Loves to put that disgusting toy right in his mouth. All the while flashing us a sly smile as we sternly yell "no." 3. Our computer cords. Putting the computer charger in his mouth and watching his parents freak out because they are terrified of electrocution is another past time of Paul's. So again we have wasted our money on all the bright, fun, educational toys for Paul. All that boy needs is a dog, some water, and electricity and he seems entertained. Sounds like a recipe for disaster.